The history of hot sauce is quite interesting, more so than someone would think. While it has not been around forever, the spicy peppers that give hot sauce its kick have existed for centuries, if not millennia and people have been enjoying spicy foods since the first bite. As time has evolved, people have found ways to bottle up these spicy peppers, manipulating and extracting their mild, medium, and oh-so-hot flavors. In 1807, the history of hot sauce came to America by way of Massachusetts, which bottled the first commercial cayenne sauce. About 30 to 50 years later, a New York based company called J. McCollick & Company created and manufactured a sauce made from wild chiles and marketed it under the name of “Bird Pepper Sauce.” Around this time, another interesting development occurred in the world of hot sauce. 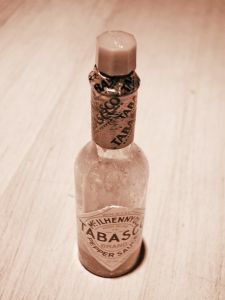 In 1849, a Louisiana man by the name of Colonel Maunsell White grew the first crop of Tabasco chiles on record and within ten years he was producing the first Tabasco sauce ever made or sold. During this same year, Colonel White gave some seeds to his friend Edmund McIlhenny, who started his own chile crop in Louisiana but was forced to flee his home for five years due to the civil war. When Mr. MCIIhenny returned to his home, the pepper plants were thriving and were also covered by small red peppers, of which he used to make a batch of sauce and send out as samples to wholesalers. His Tabasco sauce was so good that thousands of orders immediately poured in, making this hot sauce the trademark flavor of Louisiana, and later the country. In 1870 McIlhenny put a patent on the Tabasco Brand, a brand still popular today in both homes and restaurants. In the history of hot sauce, one man decided to test all the different peppers and their levels of capsaicin, the chemical that gives chiles their heat, and put them onto a chart known as the Scoville Scale. This scale was important because it helped sauce makers determine which peppers to use in their hot sauce and how to market the product. For example, green peppers have no capsaicin so they are not marketable to hot sauce consumers and would not be an ingredient in this product. A habanero chile, however, one of the hottest chile with a Scoville rating of 300,000 units or higher makes a great selling point in hot sauce advertisements. 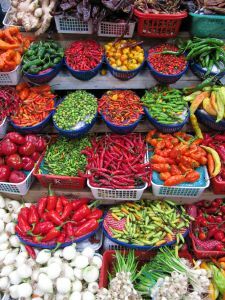 Only two peppers exceed the habanero, as well as pepper spray, which has a rating of two to five million Scoville units. After the big Tabasco brand came into being, not too much excitement went on in the hot sauce industry for quite some time. People were still inventing different hot sauce recipes and new companies started to rise, right up until the Great Depression, which slowed hot sauce manufacturing in the United States though not in the Caribbean or Jamaica, where a full scale production was in full swing by the Pickapeppa Company, still around today. Once the Depression was over, new hot sauce companies were born, though many of them started to focus on other products like salsa, guacamole, and taco sauce. These items were sold in gourmet shops until Lisa Lammé opened Le Saucier, the first store that featured only hot sauces, in 1981 Boston. Ms. Lammé looked like a small time business owner by the time 1988 rolled around and Dave DeWitt set up the first National Fiery Foods Show in El Paso, Texas, which is now an annual must-tend event for those who love to douse their food in all things hot and spicy. Mr. Dewitt’s company, Sunbelt Shows, Inc., now holds the yearly show in Albuquerque, New Mexico, where it honors the best hot sauces in the country with the Scovie Awards, bringing the history of hot sauce full circle.